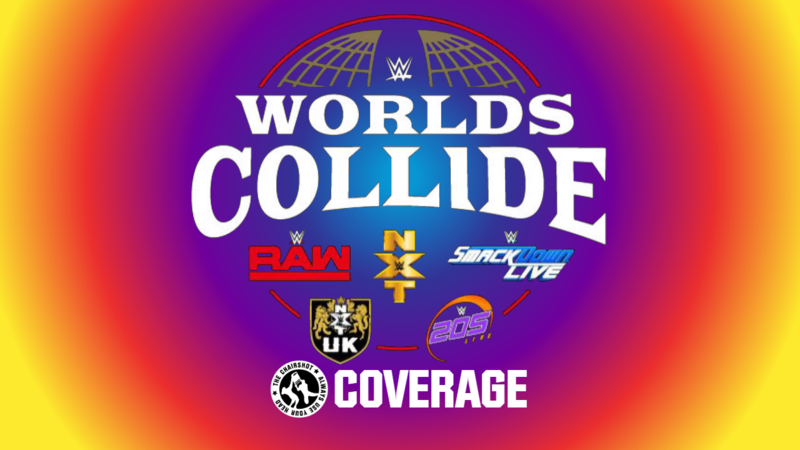 WWE brings Worlds Collide back already for WrestleMania Axxess! The past, present and future of NXT battles to prove which class is the best! Kassius Ohno VS Aiden English; Ohno wins. Harper VS Dominik Dijakovic; Harper wins. SAnitY VS The Undisputed Era; The Undisputed Era wins. Tyler Breeze VS Roderick Strong; Breeze wins. 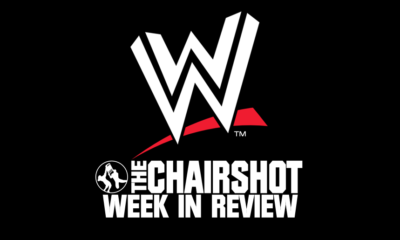 WWE brings all five brands together! Raw, SmackDown, 205 Live, NXT and NXT UK all cross paths at the first-ever Wrestlemania Axxess Worlds Collide event! Kassius Ohno VS Aiden English! 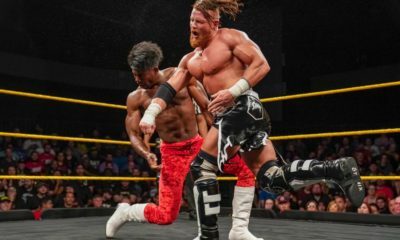 The Knockout Artist has recently moved to the UK, but he’ll still represent the American half of NXT against the alumni! Meanwhile, the original Vaudevillain returns to the ring to show he’s still got it! But will the Drama King have enough to avoid a KO from KO? Ohno stomps English around then drags him up for clubbing forearms. He drops a knee right on English’s face, then paces about. Ohno brings English up and dares him to sing as he clubs away again. Ohno wraps on a chinklock but fans rally up. English fights his way up and powers Ohno towards a corner. Ohno turns English around and gives him a quick boot. Ohno drags English to a cover, TWO! English crawls but Ohno looms over him. Ohno brings English into a Camel Clutch, but English powers out! Ohno pulls on the arms and digs his forehead into English’s back. English endures as Ohno taunts him. Fans rally more but Ohno brings English back down to a knee. English fights up again and powers Ohno around. Ohno swings but English counter punches! Ohno kicks low then turns English, but English spins out for his Dramatic DDT! Cover, TWO! Ohno rolls but English is on him with a whip to the corner. Ohno tumbles to the apron but English blocks the boot to give a haymaker! Down goes Ohno, but English builds speed to FLY! A majestic tope con hilo, but English keeps going by putting Ohno back in. English climbs up top, and fans are fired up for “Aiden Day!” English swanton bombs! Cover, TWO!! Ohno survives and English is shocked! English keeps on Ohno with a facelock but Ohno rams him to a corner. Ohno runs back in but gets a boot! English runs but gets a boot from Ohno! Ohno wristlocks and wrings English out for the Dream Crusher! Cover, Ohno wins! 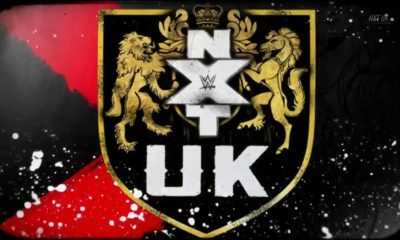 NXT or NXT UK, it doesn’t matter to Ohno, he always gets a knockout. Will this prove to the WWE that the Wrestling Genius is worth so much more than they know? Once a member of the Wyatt Family, then a Bludgeon Brother, this WWE main roster star wants to prove his worth as bad as anyone. But will his singles match return be a success against the Rare Breed Croatian Colossus? Fans cheer “Welcome Back!” for Harper and are clearly happy to see him. The bell rings and Harper circles with Dijakovic. Fans also chant “Harper! Harper!” as he ties up with Dijakovic. These two go around the ropes but end up in a corner with Dijakovic in control. The ref counts and Dijakovic backs off, but then mocks Harper’s return. Harper shoves Dijakovic but Dijakovic grins. Fans still rally behind Harper as he circles with Dijakovic again. They tie up and Dijakovic puts Harper in a corner again. Dijakovic grinds his forearm into Harper but Harper pushes back and headlocks Dijakovic. Dijakovic pulls hair and powers out. The two collide but neither man backs down. Dijakovic says that was nothing, then he pie faces Harper. Harper uppercuts Dijakovic out of the ring! Then he pursues to CHOP and forearm Dijakovic around the outside! Harper puts Dijakovic in then runs him over with a shoulder! Fans cheer as Harper flexes. Harper drags Dijakovic up and waves to the fans. Harper suplexes Dijakovic but Dijakovic blocks. Dijakovic powers Harper to a corner again, then drives in back elbows and clubbing forearms. Dijakovic says “Time to Fly!” then suplex TOSSES Harper! Harper writhes but Dijakovic covers, TWO! Dijakovic stomps Harper to a corner then throws big forearms. Fans boo as Dijakovic looms over Harper. Dijakovic drags Harper up for another suplex toss! Cover, TWO! Harper survives and fans cheer but Dijakovic is frustrated. Dijakovic toys with Harper before he puts him in a corner again. Dijakovic chops Harper while talking trash, then goes for a third suplex. Harper spins out to DDT Dijakovic right down! Both men are down but fans rally up for Harper. Harper gets up first and runs at Dijakovic to rally with forearms. Harper hits a back elbow in a corner then whips corner to corner. Dijakovic reverses but Harper tumbles out to then club Dijakovic down! Harper even slingshot sentons and BOOTS Dijakovic down! Cover, TWO! Dijakovic is tough but Harper is determined. Fans rally up again as Harper drags Dijakovic up. Dijakovic spins out for a choke grip but Harper breaks free to uppercut! Harper stalks Dijakovic only to get a boot and forearm. Dijakovic runs but into the scrapbuster! Cover, TWO! Harper can’t believe Dijakovic survives, but he won’t let up. Harper drags Dijakovic to a drop zone then climbs up. Fans fire up as Harper aims, but Dijakovic clamps on for a SIT-OUT CHOKE SLAM! Cover, TWO!! Harper still lives! Dijakovic and Harper crawl as fans rally up. Harper gets to the apron so Dijakovic pursues. Dijakovic drags Harper up by his hair, then says “Welcome back!” as he fires off forearms and elbows. Harper uppercuts back, then CHOPS! Dijakovic choke grips but Harper breaks free to scoop and slam to the floor!! The referee checks on both men while fans lose their minds. Harper and Dijakovic are okay to continue somehow, so a ring count begins. Harper sits up at 3 and leaves Dijakovic behind. The count reaches 9 and Dijakovic leaps in from the floor! But into a Half Nelson Suplex! Cover, TWO!? Dijakovic lives and immediately bails out of the ring. Harper sees Dijakovic out there, and DIVES! Direct hit sends Dijakovic into barriers but Harper puts him back in. Harper aim and spins, but Dijakovic denies the discus lariat for his own series of spinning elbows! SUPERKICK rocks Dijakovic! Harper runs corner to corner but into the CYCLONE BOOT! Cover, TWO!! Harper survives and Dijakovic is in shock. Fans know “This is Awesome!” Dijakovic gets up and climbs up, but Harper stops him. Harper climbs up behind to join Dijakovic. Harper throws Dijakovic with a SUPER GERMAN SUPLEX! But Dijakovic lands on his feet?! To SUPERKICK Harper! Harper falls out of the ring, Dijakovic FLIES! Dijakovic puts Harper in while fans lose their minds. Springboard elbow drop! Cover, TWO!! Dijakovic doesn’t stop, he climbs right up top again. MOONSAULT!! Cover, TWO!! Harper survives again! Fans are strong for Harper while Dijakovic grits his teeth. Dijakovic drags Harper up by his beard but Harper is dead weight. Dijakovic keeps pulling, and stands Harper up to throw forearms and CHOPS. Harper stays standing, and hits the DISCUS!! Cover, Harper wins!! An incredible match for a highly anticipated return! And he even shows Dijakovic respect as he offers a hand. Dijakovic accepts it, but also promises to go this again some day. With this victorious return to the ring, will Harper finally climb to the top of the WWE? SAnitY VS The Undisputed Era! The wild Alexander Wolfe and Beast of Belfast, Killian Dain, haven’t had much exposure on WWE SmackDown, but the madness never stops. Meanwhile, Kyle O’Reilly & Bobby Fish have reunited now that the Infamous One is 100% healthy. 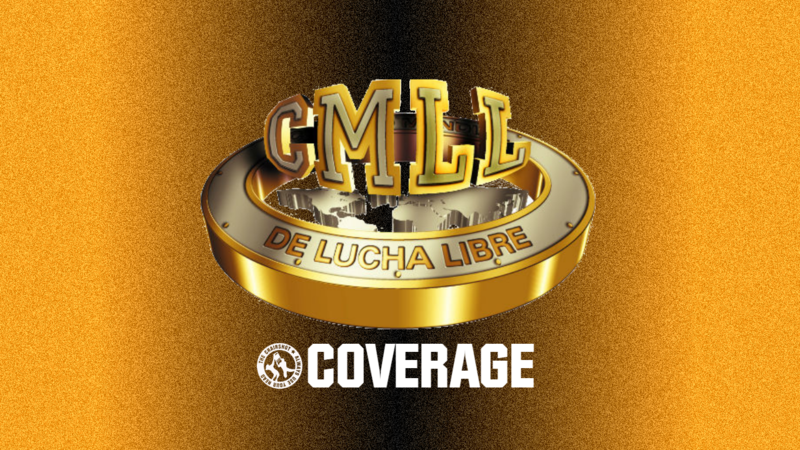 Which tag team earns some much needed momentum towards their brand’s tag team titles? The teams sort out and O’Reilly starts against Wolfe. Wolfe and O’Reilly circle and O’Reilly drops for a foot guard. Wolfe just waves hi so O’Reilly gets back up. They tie up and O’Reilly gets a waistlock. Wolfe works his way out and to a wrench. Wolfe hip tosses O’Reilly down then waves hi again. O’Reilly kicks from the mat then gets a leg. Wolfe hops to avoid the full takedown, then grabs O’Reilly by the ear! O’Reilly pops out but Wolfe spins around. They go around as O’Reilly wants the arm, but Wolfe pushes him away to rock him with a right. O’Reilly swings but avoids all of Wolfe’s wild swings. Wolfe dares O’Reilly to get back in the ring but O’Reilly takes his time. Killian Dain starts telling O’Reilly to get in but Fish comes around to defend his friend. Eric Young steps up and reDRagon backs off. O’Reilly turns around and is immediately confronted by Wolfe’s wild mosh pit swings! O’Reilly scrambles to his corner while Wolfe keeps swinging. Wolfe sits down and smiles at O’Reilly but then gets back up when he sees Fish tag in. Fish and Wolfe circle but Fish keeps his eyes on Dain and Young. Fish stays out of Wolfe’s grasp so Wolfe goes after O’Reilly! O’Reilly avoids the hands and Fish knees Wolfe. Fish throws hands then whips but Wolfe kicks Fish back. Wolfe scoops Fish and holds him up there before throwing him down. Cover, TWO! Wolfe drags Fish up and over to tag Dain. Wolfe gives Fish an atomic drop then feeds him to Dain’s DIVIDE! The crossbody flattens Fish and Dain covers, TWO! Tag to Wolfe and Dain snapmares Fish for Wolfe’s sliding forearm. Dain adds an elbow then Wolfe drops a knee. Cover, TWO! O’Reilly runs in but gets a German Suplex! But he pops right up, only to tumble out. Wolfe drags Fish up for a fireman’s carry but Fish fights out. Fish tackles Wolfe to his corner but Wolfe uppercuts back. Fish runs in and blocks the boot to put the leg on the rope. He fires off body shots but Wolfe throws hands back. The ref counts and breaks them up at 4. O’Reilly returns to dragon screw Wolfe on the ropes! Fish elbows Wolfe down then drags him over to the corner. Fish kicks and forearms then O’Reilly tags in. reDRagon mug Wolfe then O’Reilly works the leg with a spinning toehold. Fans rally as Wolfe endures. Wolfe gets the ropebreak but Fish kicks at the hands. Fish tags in and drops a slingshot senton on Wolfe. Fish taunts Dain then brings Wolfe up. Wolfe throws forearms so Fish gives them back. They go back and forth, until Fish sweeps the bad leg! Tag to O’Reilly and reDRagon double whips Wolfe. Wolfe holds ropes to avoid the kicks. Wolfe dumps Fish out then elbows O’Reilly away. Fish jumps on for a sleeper, but Wolfe throws him off. O’Reilly runs but is sent out, Wolfe dodges Fish to tag in Dain! Big Damo rallies on reDRagon, then fireman’s carry for O’Reilly. Fish runs and crossbodies, but is caught! Dain hits a Samoan Drop and Fall Away Slam! Fans fire up with Dain as he runs corner to corner to splash Fish then O’Reilly then shotgun dropkick Fish! Dain gives O’Reilly the Wasteland to a back senton, then Vader Bomb! Cover, but Fish breaks it. Wolfe returns but Fish throws him back out. Dain tosses Fish to the apron but runs into O’Reilly’s boot. Fish tags in and reDRagon runs a train in the corner. Thigh kick to exploder! Cover, but Wolfe barrels through to break it! All four men are down and fans cheer. They stand, and Dain puts O’Reilly in a corner. Wolfe whips Dain in for a big back elbow. Dain puts Wolfe on the apron so SAnitY can meet in the middle with boots! 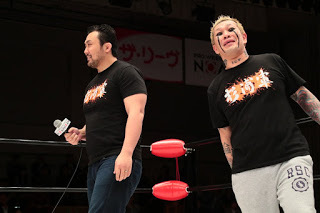 SAnitY focuses on Fish, backstabber to back senton! Cover, TWO!! Fish lives but SAnitY keeps going. Dain tags in and Wolfe feeds Fish to the scoop. Wolfe runs but O’Reilly dumps him out! O’Reilly tags Fish and chop blocks Dain down! reDRagon coordinates, TOTAL ANNIHILATION! Cover, The Undisputed Era wins! But they’re not done with SAnitY either! They stomp away on Dain so here comes Eric Young! Young throws hands on reDRagon then stomps Fish down. O’Reilly kicks but it’s blocked. Young sends the enziguri into Fish! Then he hits O’Reilly with the wheelbarrow suplex! SAnitY may have lost but they stand tall together. Will they soon stand tall against WWE tag team champions? Tyler Breeze VS Roderick Strong! Prince Pretty was once a star of WWE’s very popular Fashion Files, but things haven’t been so good since his dance partner, Fandango, went done with an injury. Will Breeze make a comeback against the Savior of the Backbreaker? Or will the Undisputed Era check off another win? The bell rings and Breeze circles with Strong. Breeze and Strong feel it out before Strong gets a takedown. Strong rolls Breeze but Breeze gets away. Strong mocks Breeze by lounging on the top rope. Breeze applauds but Strong just keeps mocking him. Breeze and Strong circle and tie up. Strong gets a waistlock but Breeze standing switches. Strong slips out to a wristlock and brings Breeze to his knees. Breeze rolls and wrenches Strong to the mat. Strong rolls to drop toehold and facelock. Strong gator rolls Breeze and floats over to a mount. Breeze resists the half nelson so Strong shifts to a headlock. Fans rally and Breeze powers out, but Strong runs him over. Things speed up and Strong holds ropes. But he still runs into a dropkick! Breeze shows Strong how to really relax on the ropes. Strong runs in but into a takedown! And catapult into buckles! Strong falls down and Breeze climbs up. Strong swings but Breeze knocks him away. Breeze reaches the top but Strong trips him up! Breeze tumbles out but Strong pursues to CHOP Breeze! Strong rams Breeze into the apron then chops him again. Strong puts Breeze in then drags Breeze up by his hair, for the first backbreaker of the match! Breeze writhes and winces but Strong taunts him. Strong stomps Breeze then throws forearms in the corner. Strong stalks Breeze to kick him while he’s down. He keeps on Breeze by digging a knee into his chest for an inverted clutch. Breeze endures as fans rally up. Breeze fights out but Strong shoves to dropkick Breeze down! Cover, TWO! Strong keeps on Breeze with a rain of right hands. Strong gives Breeze some Danielson Stomps, then “frames the picture” as he drags Breeze back up. He lifts Breeze for another backbreaker! But he doesn’t stop there, he gives Breeze a third! Strong bends Breeze in the backbreaker rack across his knee. Fans rally and Breeze fights out. Strong keeps on Breeze and the two trade haymakers. Strong CHOPS Breeze then scoops for a gutbuster! Cover, TWO! Strong puts Breeze in a chinbar camel clutch, but Breeze endures. Fans rally and Breeze powers his way up. Breeze throws body shots but Strong shoves to knee Breeze low. Strong throws Breeze with an Olympic Slam! Cover, TWO! Breeze lives and Strong grows frustrated. Strong powerbomb lifts Breeze to the Canadian torture rack, and combines it with the Gory Special. Breeze endures this Strong rack and fights out with elbows. Breeze spins and arm-drags Strong then throws body shots! Strong brings Breeze up but gets a jawbreaker for it! Breeze boots and forearms Strong then throws him out. Strong hurries back in but gets an enziguri! Cover, TWO! Breeze is too tired to be upset, and both he and Strong get to ropes. Fans fire up and Breeze stomps like the Heartbreak Kid. Strong stands but avoids the kick. Breeze follows and shoulders Strong on the apron. Breeze shovels Strong back in, but Strong fireman’s carry. Prince Pretty slips out and SUPER MODEL KICKS Strong down! Cover, TWO!! Strong survives but both he and Breeze are slow to stand up. Fans rally and Breeze drags Strong up. Strong fires forearms but Breeze gives them back. Strong CHOPS but Breeze kicks. They brawl and Breeze stomps a mudhole into Strong! The ref backs Breeze off but Breeze whips corner to corner. Strong reverses and redirects Breeze at the ref! Breeze stops himself, Strong full nelsons, but Breeze swings out to crucifix pins! TWO, and Strong catches the Beauty Shot heel kick for another backbreaker! Cover, TWO!! Breeze survives and Strong can’t believe it. Strong drags Breeze up as fans rally. Strong hoists Breeze up but Breeze resists. Fans duel as Breeze fights back. Strong backs off and gets a knee. Breeze chicken wings but Strong denies the Unprettier with a takedown. Strong goes after the legs and tries to turn Breeze but Breeze resists. Breeze fights free then runs at Strong. Strong boots, enziguris and leaping knees! Strong gives Breeze the back lift slam! Cover, TWO! Fans fire up for Breeze while Strong grits his teeth. Strong drags Breeze up again while fans duel. Breeze resists the suplex so Strong knees and elbows him around. Strong brings Breeze up, but Breeze knees out! Cradle counter, TWO!! Breeze dodges the knee to enziguri! UNPRETTIER! Cover, Breeze wins!! That was gorgeous! Breeze endures and wins what could prove to be a critical match in his WWE career! Will this help propel Breeze back into the spotlight? Not a bad start to these WrestleMania Axxess Worlds Collide specials. Though, if we’re to assume all four pieces are an hour each, why stretch things out to the next three weeks? Just kidding, I already know the answer. Vince wants to stretch this out to get more views. 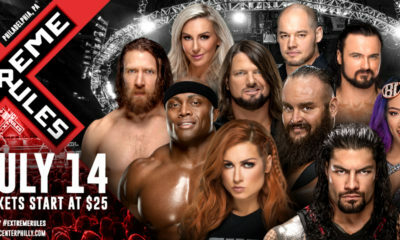 The same people who would watch a massive four-hour special would watch four separate one-hour specials, but this way, Vince can count that number four times. 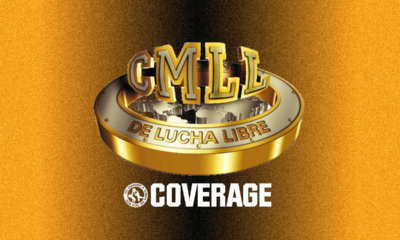 But that aside, this also gives each segment of this Worlds Collide event (NXT, Cruiserweight, Women’s Division, battle royals) separate spotlight that they all need. I really liked a lot of went on in this NXT Current VS Alumni special, but I would’ve rearranged matches a bit. 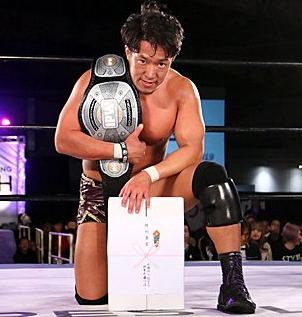 Ohno VS English was fine as an opener, and naturally Ohno wins because he’s been staying sharp while English hasn’t wrestled since his short feud with Rusev. But I would’ve made Harper VS Dijakovic the main event, because the fans were red hot for him and that match was just flat-out great. So great to see Harper back and winning, and also (unofficially) having his full name back. I really do hope this match propels Harper to great things wherever he ends up with it being Superstar Shake-Up week. Having the Undisputed Era back-to-back was a good idea, but I would’ve shifted them up. That tag match was alright, but given SAnitY loses just to stand tall after, it would’ve been a better second. 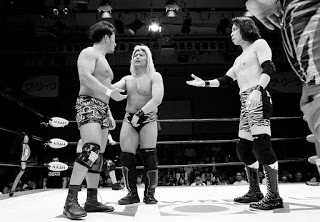 Breeze VS Strong was pretty solid itself, so it did fine as a main event. But it would’ve been good as a third match, too, to give us back-to-back victorious returns. Breeze definitely needed to win more so he could stay afloat, and I hope he gets to do something more wherever he ends up after the Shake-Up. Strong also was destined to lose because of this growing story with him and the Undisputed Era. It looks like Strong might be kicked out, so between not helping Adam Cole win the NXT Championship and losing to Breeze, all the more reason the others will want to turn on him.